It Is The August Vacant Period. I briefly watched and was surprised at the apparent ga ga media coverage of the super power status this new white elephant of a boat pottered into Portsmouth yesterday. It was good to see the young crew members embracing the discipline of military service, of course. Yet one quite funny and typical aspect of the charade was the somewhat obvious missing reason for why such vessels are supposed to exist. Come on, it's a computer image above but was not far off the camera shots of the real thing yesterday. What's missing? Stare as hard as you can. Concentrate really, really hard. No sound necessary to determine what's not present. 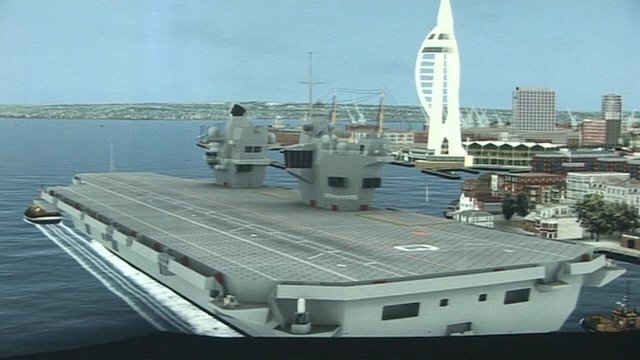 This in fact is Great Britain's new, all shiny, expensive, aircraft less, aircraft carrier. No doubt some gold ring drenched, epaulette laden, big wig Admiral, guaranteed a mega salaried sinecure after retiring with a massive pension pot, if questioned as to the dearth of actual aircraft, tell you with a wink, "They're all stealth machines and invisible to all but we top brass and politicos who got the bungs for this expense". On a more serious note, tragic beyond measure yet easily brushed aside by all in power, is the Muslim scum grooming gangs. Day i day out this barbaric cultural and racist horror continues. Police and the likely upper echelons of the Establishment are in many cases complicit in these crimes for whatever reason. Some likely to join in the debauchery safe in the knowledge that May, Corbyn et al don't give a toss. Their outrage and fierce determination to stamp this evil out is as in your face as those planes missing from the decks of these vainglorious ships. Sarah Champion told to resign after saying it as it is, by that unshaven, unkempt Trot of an excuse for a man, Corbyn. A man for whom millions of heathen, filthy scum votes are worth so much more than the abused, tortured kids now littering our society like the curse of plastic waste. The latter deemed worthy of campaigns and guilt inducing media finger pointing, the former collateral damage in the drive for a multicultural hell of a Utopian fallacy. The rest of our political class no different. The PM spouting "super power" crap on the empty flight deck of HMS Madge and never one single word out of her mouth in sympathy for these tortured kids. Shame on them all. How dare they vilify Anne Marie Waters or anyone who speaks up, as Sarah Champion has. You know what, I regard our MPs, everyone of them, to be more guilty in ignoring this market in slavery and sexual depravity, than the peasant ignorance and racism of the filth doing this evil damage. 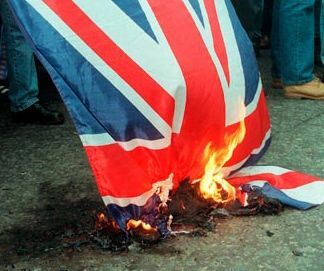 As for Labour and Corbyn, you have to seriously wonder if their lack of condemnation has a sinister connection, you really do. For sure paedophilia in high places is as rife as ever it was. In barely a second of searching we get this plethora of detail. Silly season or not, we are now a third world hell hole for many. Not least these kids now part of a despicable trade run by men from the very dark ages and whom we have invited onto our shores and seemingly relish their backward nastiness as a multicultural benefit. Yeah, sure it is. It offers an endless supply of kids for its delectation. That and no shortage of social service's pimps and procurers. It was never meant to have UK aircraft and crew it was part of our EU military contribution. The crew were meant to be European as trialled on a destroyer (which most people won't have heard of). These projects have been going on since the 90s.